Vladimir Putin has penned his first political platform in years, to be unveiled weeks before the presidential vote. Faced with dwindling popularity and an angry public, Prime Minister Vladimir Putin spent the New Year's holiday personally penning his own political program for his bid to return to the presidency for a third time, his spokesman said Tuesday. Combining his "personal vision" with economic and political proposals, the program marks the first time in years that Putin has actually presented a formal written platform. "It will be Putin's personal vision, both as a person and a politician, which he will set forth forcefully," his spokesman Dmitry Peskov told Izvestia on Tuesday. Peskov said Monday that his boss has spent all of the long New Year's holiday drafting the program — by hand — and plans to unveil it on Feb. 12, just three weeks before the March 4 election. The program addresses hard-hitting questions such as corruption, alcoholism and aging infrastructure problems, Peskov said. Veteran political analysts say Putin — whose popularity has sunk amid large-scale protests against alleged fraud in the December State Duma elections — must adapt his approach to governance in the face of a changed political environment. "Every program has to adjust to the changes society is undergoing and today society is changing every hour and every minute," Kremlin-connected political expert Vyacheslav Nikonov told The Moscow Times. That change may be outstripping Putin's ability to keep up, as a new poll released Tuesday by the state-run VTsIOM polling group showed his standing with the public has slipped dramatically. According to their findings, Putin was named Politician of the Year by just 38 percent of Russians — down 17 percent from a year earlier. President Dmitry Medvedev, who announced in September that he will not seek a second term, camein second with 19 percent, down 18 points from the year before. Peskov said Putin's response is based on one drafted by a pro-Putin think tank, the Institute for Social, Economic and Political Research, which is headed by Nikolai Fyedorov, the former governor of Chuvashia and a justice minister under Boris Yeltsin. The original program was prepared from proposals gathered from more than 1.5 million people, and was used by the ruling United Russia party prior to the contested Dec. 4 Duma elections. The program was a combination of populist positions like increasing the quality of domestic medical care and banning alcohol advertising. Putin who entered Russian politics in 2000 and served as president for two terms before serving as prime minister, has in the past only unveiled his agenda directly to lawmakers or during his state of the nation speeches or annual call-in show. He has also never participated in political debates. 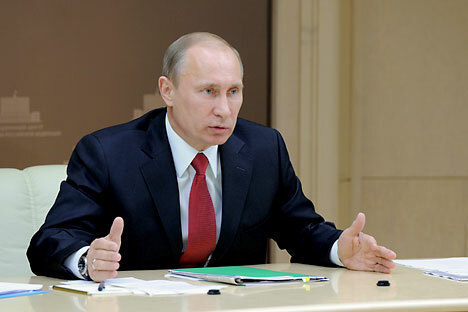 In 2007, the United Russia party used a compilation of Putin's economic and political proposals, dubbed "Putin's plan," during the parliamentary campaign. The phrase — which was turned into the party's election bumper sticker slogan — was mocked by opponents. But some party members take the platform very seriously, insiders say. "I once spoke to a United Russia official who was enraptured by his own words while speaking about the plan — like it was something sacred," said a government-connected political strategist, who spoke on condition of anonymity so as not to disturb his relations with the party. But sticking too closely to his earlier political agenda may not be enough to sway an uneasy populace. While living standards have improved during Putin's tenure — largely due to high oil prices — parts of the middle class have grown dissatisfied with the status quo, said Alexei Makarkin, head of the Center for Political Technologies. "It is not enough to talk about stability which many people now view as stagnation," Makarkin said. Before the 2000 presidential election, Putin used an economic program written by the Сenter for Strategic Development, founded by liberal economist German Gref, who was the economic development minister early in Putin's tenure. "But later, it was Putin himself who was turned into a program," Makarkin said. Public Chamber member Iosif Diskin said Putin understands the need for change and has paid attention to the words of former Finance Minister Alexei Kudrin and Russian Orthodox Patriarch Kirill, who spoke about the need for the authorities to listen to protesters. Diskin has even said that Putin might agree to a debate with his strongest rival, Communist Party presidential candidate Gennady Zyuganov. "He has good oral skills and knows how to use the Russian language," Diskin said of Putin. But Makarkin said Putin will likely do everything he can to avoid debates — even if a second round of voting is required — following in the footsteps of his predecessors, Mikhail Gorbachev and Boris Yeltsin. "Debates will be a challenge for him, since he isn't used to such a format," he said.